Brad Van Dommelen of Traverse City Tourism named "CVB Star of the Year"
Brad Van Dommelen, president/CEO of Traverse City Tourism, has been named a “CVB Star of the Year” by the Michigan Lodging and Tourism Association. The award was announced March 23 in Grand Rapids at the association’s “Stars of the Industry” awards dinner, part of the annual Pure Michigan Governor’s Conference on Tourism. 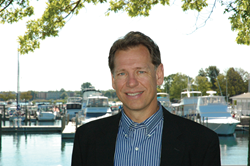 Van Dommelen was cited by the awards committee for his “industry knowledge, determination, attitude and imagination” in bringing Traverse City to the attention of new national and international markets, as well as his leadership at the state level, including his work to bring about a change in Michigan law allowing destination marketing organizations to increase their tourism promotion funding to further benefit their communities and the state. Organized in 1981 as the Traverse City Area Convention and Visitors Bureau, Traverse City Tourism is the area’s official destination marketing organization. Its focused mission is to stimulate economic growth by attracting convention business and developing leisure tourism. Van Dommelen was among 14 awardees recognized at the annual banquet, including hotel and tourism workers from Detroit, Lansing, South Haven, Grand Rapids, Dearborn, Adrian, East Lansing, Harbor Springs, Gaylord, Port Huron and Frankenmuth. The Michigan Lodging and Tourism Association represents hundreds of hotels, motels, resorts, and bed and breakfasts that comprise more than 50,000 guest rooms throughout Michigan. MLTA is the only statewide trade association advocating for the state’s lodging and tourism industries.